Saya's father and the priest at the shrine where he and Saya reside. While Saya is out fighting the Furukimono, he worries about her, though he is not inclined to show it. He cares deeply for Saya and helps with her training, often commenting on her clumsiness. Tadayoshi is actually a hybrid between a furukimono and human due to the mating between the two species. When he fights Saya at the finale, Saya kills him when she realizes that an over-excessive consumption of her blood has driven him berserk. In his final moments, he confesses that his paternal feelings for her were genuine and he cherished their time together. 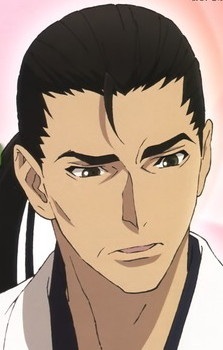 Saya grieves deeply over his death and recognizes him as her father.